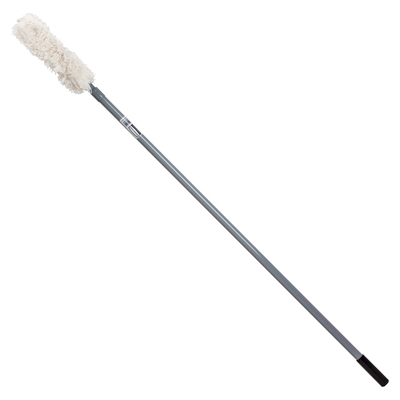 Overhead Duster Is The Sensible Solution To Routine Overhead Dusting. Equipped With A Telescoping Handle For Simple, Efficient Overhead Use, This Super Hiduster Tool Extends Up To 102" (8-1/2' Or 2.6 M) For Higher Ceilings. Dusting Cotton Head Is Launderable For Long Product Life. Handle Is Made Of Vinyl.. Overhead Duster Is The Sensible Solution To Routine Overhead Dusting. Equipped With A Telescoping Handle For Simple, Efficient Overhead Use, This Super Hiduster Tool Extends Up To 102" (8-1/2' Or 2.6 M) For Higher Ceilings. Dusting Cotton Head Is Launderable For Long Product Life. Handle Is Made Of Vinyl.